After working together for 6 years, a lot have changed since Queen started the collaboration with Adam Lambert. After some very good reviews from the fans and the critics, what is your opinion about the Queen+Adam Lambert 2018 European Tour? What did you think was the best and worst of this tour? That includes the show, the setlist, the lighting, the sound, the singing, etc…. KNIGHT wrote: It’s now over. I saw them last year and the show was amazing. I can't compare to previous years as it's the first time I've seen them but I thought the whole thing was brilliant, lights, staging everything. I heard they changed some of the sound equipment for 2017 and people who'd seen previous shows said it was better. Adam's voice live was awesome and sounded better than on video's I'd seen, I was really surprised how powerful his voice actually is. I was a bit disappointed they dropped some songs before the UK but tbh once at the show I never really noticed, the flow of the show and how it's put together means it just flows and you don't really notice things like that. I also love their chemistry onstage and the way they all get their time in the spotlight. It was embarrassing and cringeworthy 6 years ago and still is in 2018. AL does not fit at all, cannot sing rock songs and his voice is completely lacking emotion and depth. 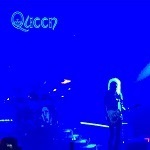 His stage manners are questionable and I will never forgive Brian and Roger that they hand him over the crown. Absolutely disrespectful. This has nothing to do with the Queen I grew up with. They had 4 great musicians and explored new grounds. Now you still have two great musicians and a nostalgia cover band. About time to let it end now after Vegas. hardwired wrote: It was embarrassing and cringeworthy 6 years ago and still is in 2018. AL does not fit at all, cannot sing rock songs and his voice is completely lacking emotion and depth. His stage manners are questionable and I will never forgive Brian and Roger that they hand him over the crown. Absolutely disrespectful. This has nothing to do with the Queen I grew up with. They had 4 great musicians and explored new grounds. Now you still have two great musicians and a nostalgia cover band. About time to let it end now after Vegas. Which show did you go to on this last tour? I rated this second European leg of the tour with a 10. Although I at first thought of a nine. But after thinking about it, I couldn’t find anything, that was really wrong or off. The show was simply excellent. I think, the only ones, who could have some criticism are the Brits, because London, Glasgow and also Dublin had seen almost the same show in December. For the people of Berlin it was completely new (apart from the few fans, who traveled to see them last year, like myself ). -I really enjoyed the change of the opener: Frank still smashed the wall (still a great image and fascinating for everyone, who hasn’t seen it before) and the band singing „Tear it up“, while Frank lifts the rest of the wall up, was a great and really fitting image. At the same it got the fans singing along loudly and fist pumping. A very welcomed change from the last tour! - The concert in itself is almost perfectly structured and is running like a very well oiled machine. Their greatest hits, mixed up with a few not so well known songs and one Lambert-song. All played pretty well by the whole band. - The joy of the band members doing their „job“. They simply have a lot of fun, all 6 of them together. It’s makes me happy, just to watch them. - The complete version of „Play the Game“ was a nice addition. I liked it more than „Get down, make love“, which had been cut. - I loooooved the addition of „The Show must go on“. I think, after he often had his problems with that song, Adam really mastered it this time. It was completely stunning live! - I still enjoy Brian’s solo. The whole production of that solo with him playing and the illusion, that Frank lifts him into space, where Brian is then playing in front of different stars and meteorites (he surely knows, what exactly is flying around there) is simply brilliant. I have barely seen anyone leaving for the toilet during that solo. Even on the contrary: people started to film it. - Adam’s singing. I know his voice is not everyone’s cup of tea. But boy, can he sing! His voice must have matured in the past six years and you can really hear that - in addition to the experience he now has after more than 170 concerts singing these songs. He stuns me every time. And yes, I can really laugh about his little jokes and his interactions with Brian. Queen’s music stands the test of time and it is played at these gigs with a modern touch. The quality of Brian’s and Roger’s playing is still superb, especially Brian. Adam has really mastered these songs. He plays with the melodies a bit here and there to not get bored (and make it sound fresh ? )but he never steers away from the Original too much. And he has really reduced his vocal gymnastics compared to the early tours. On top you get to see a band, that loves to perform together AND a light production and a stage, that is so overwhelming, that I was simply glad, that I had the chance to see it more than once: I don‘t think, youcan take all of that in at just one gig. Everything together is so overwhelming, that it’s no wonder, that many people came out of these concerts, saying: It was the best concert, they have ever seen. I believe them, because for me, I felt the same. And I will go again, if I get the chance! What would you have them do? Sit on their rich arses and twiddle their thumbs? Saw it in Antwerp and if it were to be compared to the Brussels show a couple of years' back, this latest one was a killer. The set list was a selection of greatest hits, built for an audience in majority composed of casual fans. OK, I also have an opinion on that, but it's a show... you need to keep this audience with you... and it didn't stop me singing along. The light show was amazing - the variation in colours and circular design were the best I've seen in years. Adam, like him or not, voice adapted to the rockier songs or not, stage outfits worth a comment or not... has given the opportunity to Roger and Brian to go on tour for the last 6 years, which has given us a lot of fun. They could also do it with somebody else or as a solo outing... but they'll still get s... from the purists. They are obvioulsy passionate about their music, their performance and their legacy... They have acknowledged it every night. Life goes on for those who remain and it's up to them to make the full of it. So, IMO, thanks to them (and to Mr Beach). You sound suspiciously like the guy, who has been trolling Queen‘s Online appearances for years, spilling nothing but hate towards QAL and Adam. On QueenZone the guy calls himself runner70. On here, he was callel Exodus70. If it’s you, you know your Facebook and YouTube names. You use exactly the same words and phrasing like him. „casting show guy“, „casting muppet“, „he sounds like a crying little girl“, „QAL is ridiculous“. All these are your opinions. Fine. Thanks for sharing them. But I doubt you attended one of these shows. You are just hating on the collaboration as a whole and not talking about this tour compared to the ones before. And that was, what this thread had been made for. A negative opinion is trolling? well ok your opinion then. I did not know that you just wanted answers from glowing fans of QAL. Well then a poll does not make too much sense does it? For me it is still the most laughable and fake collaboration in rock history and I am not alone with my opinion. You should live with it. Yep, the fact you just joined and the wording you use is very similar to someone on Queenzone, though not 100% sure I think it's runner to be honest, could be the other one. Please can we have one place where we can discuss the collaboration civilly and the merits or not without someone just out to argue with no real basis for their opinion other than they don't like the guy and hate the fact Brian & Roger are doing this at all. There's facebook, Queenzone, YouTube and I daresay probably other forums where you can hate on it all you want, can't we just have this one left as a reasonably positive forum. Pretty please? Again i dont understand doing a poll then when all you wanna have is raving about QAL. Learn to live with the fact that lots loathe this collaboration. Last time i checked this was a queenforum not a AL glorification board. There was the option "awful" in the poll so i voted for it and said why. So i really dont know what you are trying to tell me?? I rated it a 10. To me QAL is still quite new, I have never really been interested in both QPR and QAL until last year, when I heard about the European tour and saw there was a show in Munich (my hometown). I'm unfortunately too young to have been able to see Queen back then, but I watched all the concert releases (and some bootlegs) multiple times and always hated the fact that I never could see them live. When I read about that QAL date in Munich, I started to think anew - at least I could still see/hear Brian and Roger live, and yes, I had my problems with that whole idea of a new singer (no matter who, there were plenty other collaborations already on the FM Tribute Concert, some ok ones, some better, but never as good as with Freddie) and I didn't like QPR since I didn't think his voice fit to Queen at all. I hadn't even watched a lot of videos with AL, I just wasn't interested. But the thought of having the possiblility of hearing the Red Special live didn't get out of my head and I started watching QAL...and got to the point where I decided to go to the show. I did neither hate nor like AL as the singer, but I thought he was at least a more fitting choice than PR. So I went to the Munich show and had mixed feelings at the beginning...kinda sounds like Queen, but no, different voice...felt a little weird at first. The production on the other side was excellent, really high level and impressing! First I especially loved Brian's solos (and couldn't believe I finally heard that legendary instrument live), but the longer the show went, the more I enjoyed it. AL was likeable as a person and I didn't mind the little jokes at all. Also the rest of the audience seemed to like him, tbh I was a little bit surprised that he got so much positive reaction during the show. As I said, I enjoyed the show more and more and well, of course it wasn't Queen, but damn, it was kinda close and performances like "I Want It All" were just amazing and such a blast! Someone who doesn't like QAL once meant I just repeated what the official press release back then said when I meant that this show felt like a huge celebration of all Queen music - funny thing is, I never read or knew about this press release statement. I really felt that way that evening and it was amazing to experience so much love by the whole arena for that wonderful music, those two legends and everything else involved including AL of course. The little moments with Freddie on the screen were pure magic and got a HUGE reaction by the crowd. I didn't see one bad thing that I could say about that show after that evening. Even if I wouldn't have liked AL, those shows serve a positive purpose and the legacy of Queen. Making thousands of people happy every night with wonderful music isn't a bad thing imo...! Then the European tour 2018 was announced and though there was no Munich date this time, I felt the wish to see them again...and I did, in Berlin. I booked the ticket in February, made a small 2-day-trip, met a good old friend who lives in Berlin again and did some sightseeing. This time the show was of course mostly known to me, but it was no less exciting - in contrary, this time I enjoyed it more since I didn't have those mixed feelings anymore. I got used to this line-up and really became a fan of it. Yes, it is not the original Queen, but damn, it's still pretty amazing. And why? Because of that music...it's immortal and though I kinda understand people seeing this more as a tribute band, it can't get any better than this anymore today! I'm very glad I changed my mind last year, had two amazing nights with Queen music and even could see and hear Brian and Roger live - a dream come true! And yes, if there will be another tour (and I'm more positive about this now than last year...I think as long as the health is good with Brian and Roger, they will continue! ), I will be there for a third and who knows how many more times! Aside from my personal feelings involved in all this, I can f.e. compare the show from this tour with two other great concerts I have also seen in June - one being Iron Maiden, the other Roger Waters. Maiden are well-known as an amazing live band and also had special theatrical stage production since the 80s. This tour was maybe one of their best (an original sized Spitfire "flying" over the stage during "Aces High" f.e....!) and I had a wonderful evening. Roger Waters is also known for great productions since his days with Pink Floyd and damn, on this tour he really reached another level! Aside from maybe the biggest screen I've ever seen on the back of the stage, there was the Battery Station from the Animals cover in hanging from the ceeling in the middle of the arena with of course multiple projections throughout the show, the flying pig-drone and the DSOTM pyramid cover as lasers in the size of half the arena at the end. With QAL as the third show, this was the far the best concert-month of my life! All those three shows were awesome and I enjoyed them a lot, the QAL beeing on the same level. I might rank the Roger Waters one maybe a little higher (because of the huge and unique production), but it's really very close and QAL but on one of the best shows you can see! Be it the whole thing with Frank, the immense light show (with Brian's solo being pure eye candy) or something super simple as Brian just sitting in the middle of the arena alone with his acoustic guitar and singing "Love Of My Life" with the audience...you just notice Queen music has some unique control over the audience (also "Bohemian Rhapsody" where everybody goes nuts!). I hope it was not the last tour and that they finally release a live Blu-ray...this show should really be captured on Blu-ray! The poll wasn't started by me and I don't think there's anything wrong with giving an opinion on the show or discussing it, good and bad, so long as it's constructive. I did ask initially which show you'd seen but you didn't answer just started calling Adam a casting muppet etc. But like you say you're entitled to your opinion the same as everyone else so fair enough. Whilst there may be loads who loathe the collaboration there's equally loads who like it.